Brand new Gibson 2016 Les Paul Standard Faded 50s - Honeyburst. Limited run, only two made it to NZ. 100% Mint condition, un-played, not been a demo in a retail store. What a player! Trust me the sustain on this will blow you away. This is a fantastic deal, get one while you can. Attention Gibson fans! 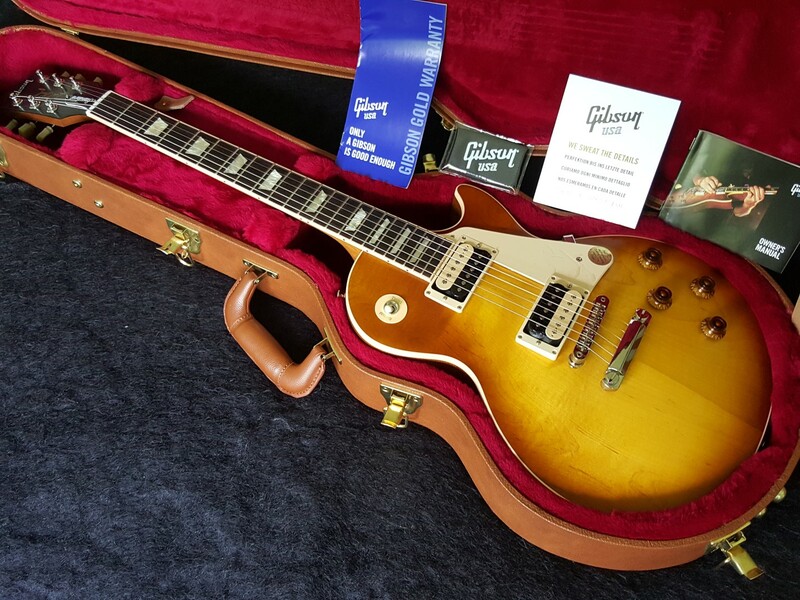 This is a genuine, USA made Gibson 2016 Les Paul Standard Faded 50s Honeyburst - Limited run Plain Top. It has incredible tone supplied by '57 Classic Plus bridge & '57 Classic neck Humbuckers, the sweetest of all. It has vintage vibe. You can experience creamy rhythm and hot molten lead sounds. This is a beauty and what a stunning price. It is the best priced, brand new Gibson 2016 Les Paul Standard you will find in NZ today. These are rare limited runs that our local stores don't offer. What an awesome axe! Sweet, sweet tone. Smooth easy action, historic vibes, part of rock n roll history, she sounds like a dream, a real blast from the past, tone beast! Weighs about 8.8lbs / 4kg. Non chambered! Sustain for a week! This 2016 Gibson Les Paul Standard Faded 50s has a beautifully smooth satin finish. No sticky nitro on the back of the neck. The satin neck feels great in your hand really, really, smooth! Rosewood Fingerboard. One piece maple top is well matched. Gibson Humbucking Pickups are Zebra '57 Classic Plus in the bridge and '57 Classic in the neck, sweetest of them all. It does not have push/pull coil taps. This is a real Les Paul Standard, 50's neck and without a huge price tag. The neck is a '50's profile, with Tone Pros Kluson-style tuners. Comes in the Gibson hardshell case with all the case candy.